Hard to believe a week has passed since we we hosted our Meetup for CoderDojo mentors from Limerick and the surrounding areas. 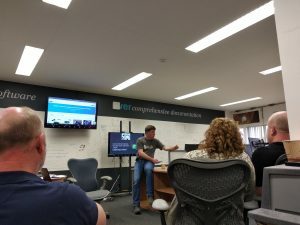 Mentors travelled to join us from Dojos in Limerick, Shannon, Ennis, Nenagh and Spanish Point, on what was a rare sunny Saturday afternoon – proving yet again that CoderDojo mentors are really some of the most devoted folks out there!! We kicked off the meet up with a series of talks from some mentoring legends from CoderDojo in the Mid West – First up was Eugene McDonough who has been a part of the CoderDojo movement since its very beginning and he shared some of the history of CoderDojo and his experiences as a long time mentor and steadfast advocate for the CoderDojo movement. 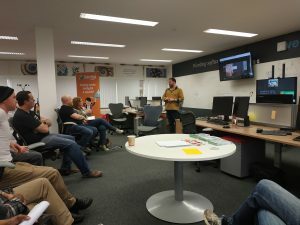 Next up we had Paul Vesy from LIT talking about all things Arduino and hardware, then we had the pleasure of hearing from Anthony Walsh from Shannon CoderDojo. Anthony shared his story of how his experiences with computing in his career and his subsequent journey to becoming a mentor with CoderDojo, now retired and devoting even more of his time to the lucky ninjas attending his Dojo. How can we encouraging more diversity in our Dojos? The role of the early introduction of to kids to all things STEM. The impact of societal role models – you can not be what you can not see. Challenging our own unconscious bias as humans and working on that too! Breaking down the perception that to be a mentor with Coderdojo you need a high level of technical knowledge. Engaging and encouraging parents to become involved as mentors in their kids Dojos. Engaging youth mentors such as those engaged in the Gaisce self development program. Gamers – how to engage them with code – tools used and what might work? Online sites such as CodeCombat https://codecombat.com/ CodeinGame https://www.codingame.com/ that enable gameplay to progress once the relevant code has been learned. Unity Playground – https://unity3d.com/learn/tutorials/s/unity-playground – More user friendly tutorials here. Retro style paper and pen for Game development is also a great tool! In between the structure of the meet up is where the magic of community happens – people connect and share their stories and their insights gathered over their mentoring journey with CoderDojo. It was during these moments we learned how Veronica from the Spanish Point Dojo got started on her mentoring journey – when her daughter wanted to enter Coolest Projects a few years ago and with no Dojo nearby – Veronica started a Dojo herself to enable her daughter to get involved and enter Coolest Projects – with zero knowledge of code but she did it anyway! Veronica is still hosting her Dojo in Spanish Point, so if your looking for a #role model….then head to Spanish Point! We also learned that one of the mentors is an international BBQ judge! So you can guess the setting for our next Limerick meet up in early summer! Huge thanks to all of the mentors who gave up their Saturday afternoon to join us and engaged with the all the topics we discussed on the day. Thanks also to Johnson & Johnson, located on the grounds of the University of Limerick who were kind enough to facilitate our meet up at their office and I would like to thank Melanie and all her team at Johnson & Johnson for looking after us on the day. Theme: Illdy. © Copyright CoderDojo Ireland 2016. All Rights Reserved.